From the top of Carosello 3000 take the street on the right (n° 162), getting around the hill that stands over the lift. Just turned the corner the view opens on the beautiful Federia valley, and continues with up and downs on the mountain ridge for about 1.2 km. 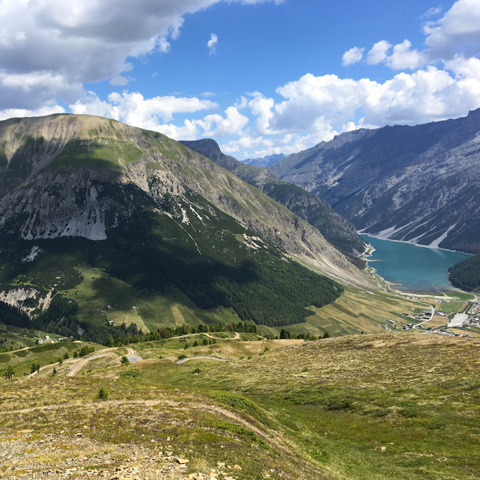 After about half an hour it arrives at Blesaccia peak: here the landscape opens 360° on two valleys (Livigno and Federia), it’s worth stop to take some picture of the enchanting landscape. Then starts the downhill, that will continue until the top of the Fontane chairlift (closed in summer): the downhill is pretty steep but you’ll walk on a wide dirt road; however in the last part, when the chairlift is already visible, you can go on a small trail near the street, which is on the ridge and hence it maintain the view over the Federia mountains. After a last part of steep downhill the trail flats, reaching the top of the Vetta chairlift where it will be easy to find many bikers training on the “Bike Academy” trail, which starts there. Here you can decide to continue on a wide road, or staying on the mountain ridge, in a more difficult trail but undoubtedly much more panoramic (n°162 B). If you choose the second option, initially it will be difficult to find the trail, but staying on the left of the mtb trail, in few minutes you’ll find the small line that in 1,5 km, going through stones and meadows, will lead you to the Costaccia restaurant. In this part is very easy to lose the trail since it’s very tight and not visible, however for the whole path you’ll clearly see the hut and the mtb trail. At Costaccia, it’s worth to take a break on the beautiful terrace and savour one of the famous local dishes, for which this place became very popular. In total, Carosello 3000 is about 4.5km far from Costaccia hut, hence consider one hour walking. If you are tired, from Costaccia you can take the gondola until Livigno, which is possible to take with the round trip pass used for the Carosello 3000 cableway. After the break go through the road, taking the Hairy Cattle trail (n° 159), open also to bikers but very little frequented. 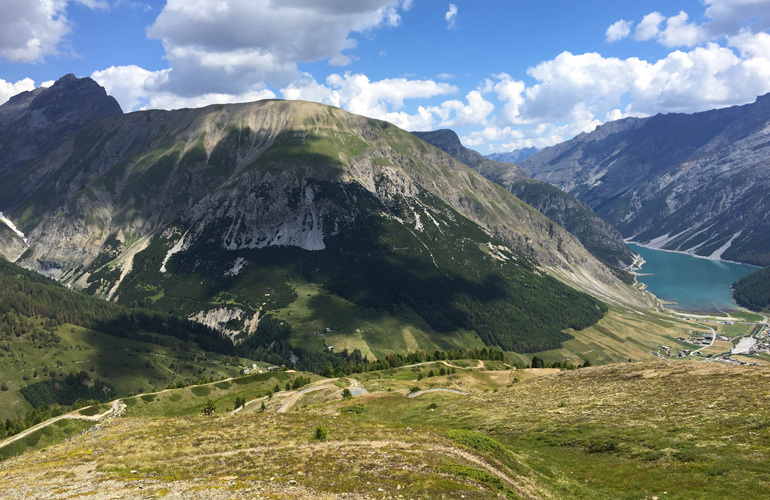 Here the trail is flat and very easy, it goes through incredible landscapes in the green, always with the view on the Livigno valley: in this trail is very easy to meet Highland cows (where the trail gets his name from), very particular cows since they have very long hair and huge horns. You can get close to them, but be careful since some of them don’t like to be disturbed. After a while the trail gets wider turning into a dirty road, but only for a small part (until the start of the Fontane chairlift). At this point, you can go straight until the Carosello 3000 intermediate station and from there going down with the lift, otherwise after almost 2km from Costaccia, turn left on the trail n° 160, heading to Livigno. Here the trail is wider and goes in a pretty steep downhill until the “Tea di Cip e Ciop” hut. Be careful to stay always on the trail and don’t take one of the many alternative trails you’ll find on your right. Finally, the trail goes back to the street, that in 500m leads you to the start of the gondola. An easy hike also for families with children, that makes you know tha Carosello 3000 mountain in all its shapes: from the rocky peak between two wonderful valleys, to small trails in the green meadows, meeting the strangest animals and savouring the incredible local flavours.